At A.G Carpet & Upholstery Cleaning we have built our reputation on the high quality of our work, our reliability and our professionalism. We are fully insured and trained in all aspects of professional carpet cleaning and professional upholstery cleaning. We ask each of our clients what they want us to achieve for them when they entrust us to clean their carpets or fine fabrics and aim to achieve this each and every time. Our free estimates and advice service provide an honest assessment of the likely outcome of any work or treatments we are asked to undertake to ensure that our clients can make an informed choice before they make the decision to book our services. I have used A.G Carpet & Upholstery Cleaning on several occasions and can honestly say this company is the best I have ever used. I was thinking of replacing my dining room carpet but thought I would have it freshened up as I was having my other carpets cleaned. The result was phenomenal, Anthony worked a miracle and yes, I still have the same carpet. Fast, friendly, reliable service. No hesitation in recommending them to anyone. "Thank you for cleaning our carpets which now look as good as new. We were extremely impressed with your professionalism and your standards." At A.G Carpet & Upholstery Cleaning we pride ourselves on our attention to detail to ensure our customers are 100% satisfied with the results. We don’t just deep clean your carpets, we remove traffic lanes, treat every stain, spot, draught mark/filter line (ie dark edges around walls and doors) and odours caused by accidents and spills. As a member of the National Carpet Cleaners Association and a Woolsafe certified operator. A.G Carpet & Upholstery Cleaning fully abide by their codes of practice. The fibre type ie wool, wool blend, synthetic etc, and the construction type of your carpet is established to ensure that the best cleaning method is selected, and all chemicals are tested to ensure no colour bleed or damage to the carpet when used. Prior to any cleaning, we will always thoroughly vacuum your carpets using a powerful commercial appliance to remove dry soiling. Your carpets are then deep cleaned using the Texatherm Cleaning System or the Hot Water Extraction Cleaning System (HWE). After vacuuming is completed, a specially formulated cleaning agent is then sprayed into the carpet to draw out the soiling from the carpet fibres. 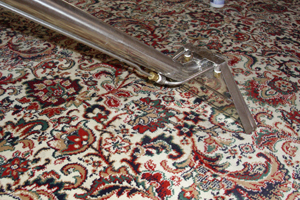 The soiling and the chemical are then extracted from the carpet by either by rinse extraction (HWE) or by the Texatherm machines heated pads leaving your carpets deep cleaned and free of any chemical residue. Wherever required both the Texatherm and Hot Water Extraction systems are used together to ensure the very best cleaning results. Stains caused by drink spills such as red wine, tea, coffee, cola etc and spots are pre treated using specialist stain removal agents appropriate to the type of stain to aid their removal during the cleaning process, and any draft marks/filter lines are treated and removed wherever possible. The carpet pile is then brushed and your furniture placed on protective pads or blocks wherever required so the rooms can be put back into immediate use during the brief drying period. We are also able to clean water sensitive Tencel and Viscose rugs and carpets using our Very Low Moisture cleaning system to clean these delicate fibres effectively and without damaging their unique look and feel. We also undertake cleaning of Seagrass, Sisal and Jute carpets, rugs and mats. We also offer a stainguarding service for new or freshly cleaned carpets to protect them from spills, stains and general soiling as well as anti static and odour elimation treatments. If you require professional fabric cleaning for your sofas, settees, armchairs, dining chairs etc please click on this link professional upholstery cleaning for more information. "As I rent my house out I have had to get Anthony to clean the carpets on a regular basis. Sometimes I would have thought that it was impossible to remove the stains, but they always come up like new by the time he works his magic. A real gentleman as well." "The service was excellent, efficient, professional and friendly. Our carpet never looked so good. We have recommended your services to our friends, families and work colleagues. We will not hesitate in contacting you again. Thank you A.G Carpet & Upholstery Cleaning." The A.G. Carpet & Upholstery Cleaning Guarantee - 100% satisfaction or I won't charge you - guaranteed!